Five ultraviolet (UV) spectrophotometer nitrate analyzers were evaluated by the U.S. Geological Survey (USGS) Hydrologic Instrumentation Facility (HIF) during a two-phase evaluation. In Phase I, the TriOS ProPs (10-millimeter (mm) path length), Hach NITRATAX plus sc (5-mm path length), Satlantic Submersible UV Nitrate Analyzer (SUNA, 10-mm path length), and S::CAN Spectro::lyser (5-mm path length) were evaluated in the HIF Water-Quality Servicing Laboratory to determine the validity of the manufacturer's technical specifications for accuracy, limit of linearity (LOL), drift, and range of operating temperature. Accuracy specifications were met in the TriOS, Hach, and SUNA. The stock calibration of the S::CAN required two offset adjustments before the analyzer met the manufacturer's accuracy specification. Instrument drift was observed only in the S::CAN and was the result of leaching from the optical path insert seals. All tested models, except for the Hach, met their specified LOL in the laboratory testing. The Hach's range was found to be approximately 18 milligrams nitrogen per liter (mg-N/L) and not the manufacturer-specified 25 mg-N/L. Measurements by all of the tested analyzers showed signs of hysteresis in the operating temperature tests. Only the SUNA measurements demonstrated excessive noise and instability in temperatures above 20 degrees Celsius (°C). The SUNA analyzer was returned to the manufacturer at the completion of the Phase II field deployment evaluation for repair and recalibration, and the performance of the sensor improved significantly. In Phase II, the analyzers were deployed in field conditions at three diferent USGS sites. The measured nitrate concentrations were compared to discrete (reference) samples analyzed by the Direct UV method on a Shimadzu UV1800 bench top spectrophotometer, and by the National Environmental Methods Index (NEMI) method I-2548-11 at the USGS National Water Quality Laboratory. The first deployment at USGS site 0249620 on the East Pearl River in Hancock County, Mississippi, tested the ability of the TriOs ProPs (10-mm path length), Hach NITRATAX (5 mm), Satlantic SUNA (10 mm), and the S::CAN Spectro::lyser (5 mm) to accurately measure low-level (less than 2 mg-N/L) nitrate concentrations while observing the effect turbidity and colored dissolved organic matter (CDOM) would have on the analyzers' measurements. The second deployment at USGS site 01389005 Passaic River below Pompton River at Two Bridges, New Jersey, tested the analyzer's accuracy in mid-level (2-8 mg-N/L) nitrate concentrations. This site provided the means to test the analyzers' performance in two distinct matrices—the Passaic and the Pompton Rivers. In this deployment, three instruments tested in Phase I (TriOS, Hach, and SUNA) were deployed with the S::CAN Spectro::lyser (35 mm) already placed by the New Jersey Water Science Center (WSC). The third deployment at USGS site 05579610 Kickapoo Creek at 2100E Road near Bloomington, Illinois, tested the ability of the analyzers to measure high nitrate concentrations (greater than 8 mg-N/L) in turbid waters. For Kickapoo Creek, the HIF provided the TriOS (10 mm) and S::CAN (5 mm) from Phase I, and a SUNA V2 (5 mm) to be deployed adjacent to the Illinois WSC-owned Hach (2 mm). A total of 40 discrete samples were collected from the three deployment sites and analyzed. The nitrate concentration of the samples ranged from 0.3–22.2 mg-N/L. The average absolute difference between the TriOS measurements and discrete samples was 0.46 mg-N/L. For the combined data from the Hach 5-mm and 2-mm analyzers, the average absolute difference between the Hach samples and the discrete samples was 0.13 mg-N/L. For the SUNA and SUNA V2 combined data, the average absolute difference between the SUNA samples and the discrete samples was 0.66 mg-N/L. The average absolute difference between the S::CAN samples and the discrete samples was 0.63 mg-N/L. 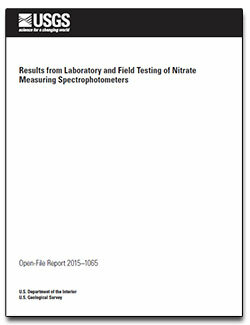 Snazelle, T.T., 2015, Results from laboratory and field testing of nitrate measuring spectrophotometers: U.S. Geological Survey Open-File Report 2015–1065, 35 p., https://dx.doi.org/10.3133/ofr20151065.